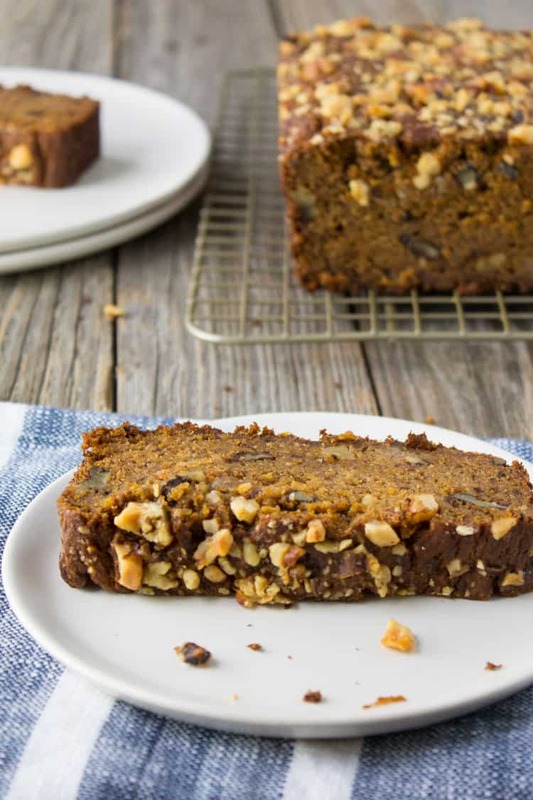 Comforting, sweet, and satisfying, this whole wheat butternut squash banana bread packs in fruits AND vegetables, whole grains, and nuts for a nutrient-packed breakfast or snack. I totally dropped the ball on quick breads Recipe Redux theme last month. I had the best intentions and even bought all the ingredients for the recipe but it snuck up on me and to preserve my sanity (and my Friday night), I decided not to force the recipe and knew that I would get to it in good time. Well, good time it did take. The first loaf was meh. It was too moist and almost looked undercooked. Plus, I realized my baking powder was expired so the loaf didn’t rise at all. In fact, I think it actually sunk in a little (insert embarrassed emoji face here). But it’s all good because the second batch turned out BOMB DOT COM. Like want to stuff my face in the entire loaf bomb dot com. Whole grains or no grains. Pumpkin’s been done before….many times. 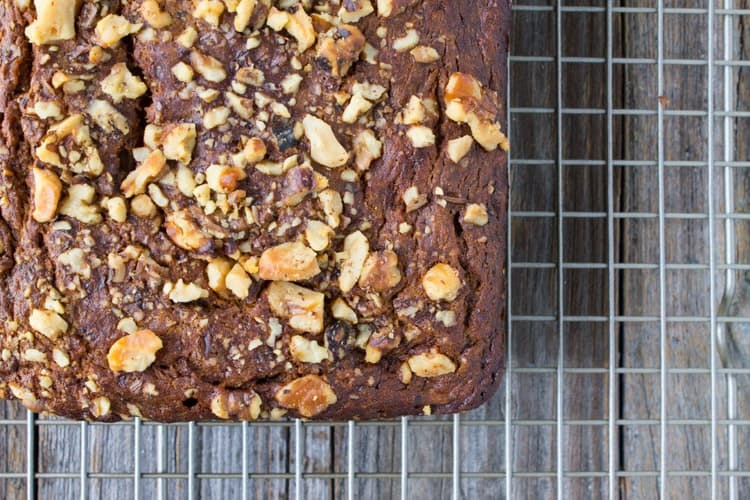 Banana bread is the best bread. 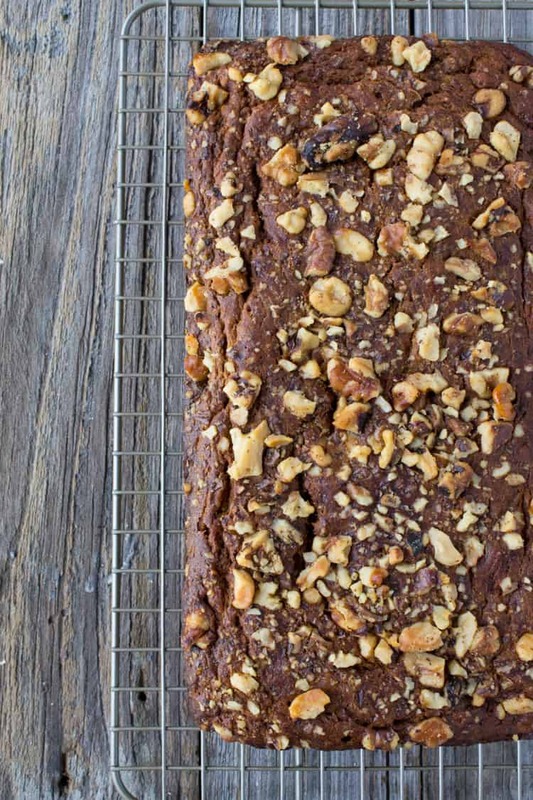 Do you agree that banana bread is the best? It reminds me of my childhood because I remember it was one of my favorite things to help bake when I was growing up. Anytime there were ripe bananas in the fruit basket, you knew what was about to go down in the Lydon household. But I think this unfair ripe banana competition is about to change course because now I have a recipe that’s much healthier, made with whole grains, nuts, unrefined sweeteners, and SQUASH! And butternut squash is packed with vitamins A and C, fiber, potassium, and magnesium. 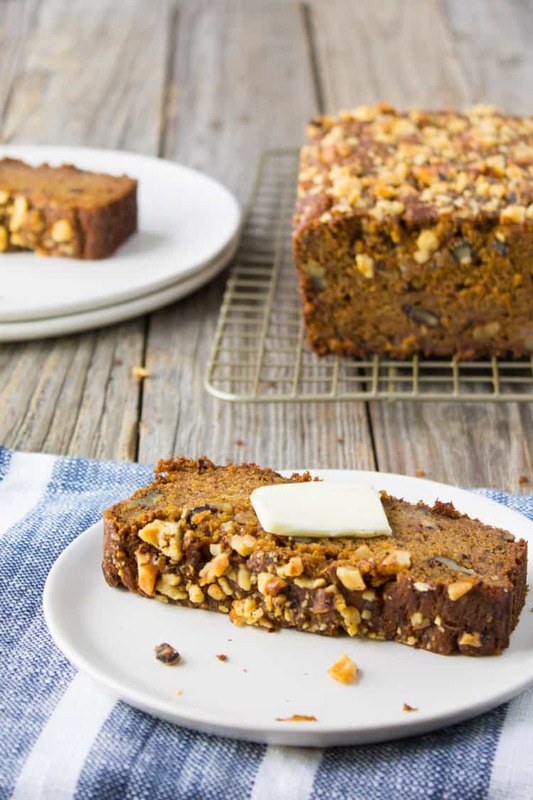 Just like you can’t taste zucchini in zucchini bread, you can’t really taste the squash in squash banana bread. So all you squash haters out there can rejoice. This bread is perfect slightly warmed with melted butter or covered with a slab of peanut butter. 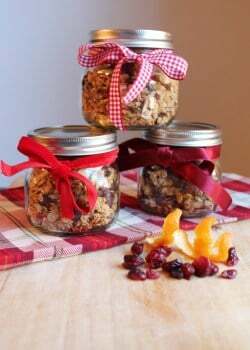 It makes for a delicious snack or comforting breakfast and pairs perfectly with a piping hot cup of coffee or breakfast tea. And since the holidays are upon us, this bread would make for a delicious DIY holiday gift too! Preheat oven to 350 degrees F. Lightly grease a 9×5 bread pan with coconut oil. In a medium bowl, whisk banana, squash, eggs, oil, and vanilla until combined. In a large bowl, mix together flour, baking powder, baking soda, sugar, pumpkin pie spice and 1/2 cup walnuts. Transfer wet ingredients to the dry and mix until just combined. Pour batter into loaf pan and sprinkle 1/4 cup walnuts over top. Bake for 60-70 minutes, or until toothpick inserted into center of loaf comes out clean. Let cool for about 10 minutes in pan and then transfer to a wire rack to finish cooling. 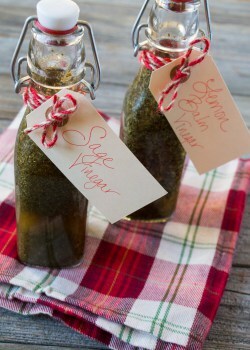 You can buy canned butternut squash puree or make your own puree by cutting a butternut squash in half lengthwise, removing seeds, brushing with olive oil and roasting at 400 degrees F, flesh side up, for 25-35 minutes, or until tender. Then scoop out the flesh of the squash and transfer to a blender or food processor to puree. Tell me, have you ever tried butternut squash puree in a bread before? Made this this morning, and I couldn’t get it cooked all the way through! Even after an hour and 20 minutes it was quite raw in the middle. So now I’m slicing it and sticking the pieces in the toaster oven to dry out the middle and finish cooking. It tastes great tho!! I think it would be easier to get it baked through as muffins… doing that next time. Oh bummer! Sorry the baking time was off for you but glad it still tasted good! Baking times are always estimates as all ovens are different but I’ll retest this to see if the baking time needs to be adjusted. Hi Rachel – just a follow-up that we retested this recipe and felt the baking time and temperature did not need to be adjusted. Sorry again that it didn’t seem to work for you! Just baked this bread and it is DELICIOUS! I always use overripe bananas so I cut the sugar, and I only had a little leftover butternut squash so here is my adjustment: 1 1/2 cups banana, 1/2 cup butternut squash, 4 TBS light brown sugar, 4 TBS honey. Mine didn’t rise much but it usually doesn’t. It is really moist, even the edges are moist, just a little “crunch” and tastes like the brown sugar. Thanks for the inspiration! So glad you loved it, Melanie! Thanks for sharing your adjustments! Hi Gene – you can definitely make this without the nuts! 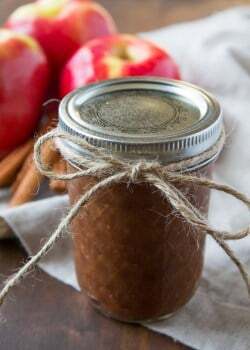 What do you think about using maple syrup instead of coconut sugar? You might just need to add a little more dry ingredients to balance out the extra wet ingredient. Let me know if you try it how it turns out! Just made this but as muffins instead of bread– so yummy!! (Just bake at 400 for 20-25 min). Also I didn’t have quite enough butternut squash so I added some applesauce and Greek yogurt to make up the difference. They are so delicious!! I’m glad I took a gamble and doubled the recipe!!! Thank you so much! I’m really glad you loved it! Yum! I love adding sweet potato to quick breads, so I can imagine how nice and moist butternut squash makes this bread. I made this loaf last night and it is so delicious! I used a stick of butter (melted) instead of oil and 1/2 cup of spelt flour with 1 cup of whole wheat flour. It is incredibly moist and not too sweet…..would highly recommend ! Thanks for sharing, Tamara! SO glad you enjoyed it! Can’t wait to make it again soon now that fall is here! This bread was gobbled up by my whole family! I doubled the recipe, used a cup of coconut sugar and I found it to be sweet enough. Also used 1/2 sprouted spelt and 1/2 sprouted whole wheat flour. I will definitely make this again. Thanks for the recipe! Nice! It’s one of my favorite recipes too. So glad your whole family enjoyed, Alina! I haven’t tried making this vegan but would suggest testing it out with flax eggs. 2 tbsp ground flax + 6 tbsp water in the fridge for 15 minutes to thicken. Let me know how it turns out! What an awesome combo! These pictures are all so beautiful and the texture of the bread looks amazing! haha, yess, I can totally relate to be the kid who was in charge of making banana bread any time there was rotten bananas around. 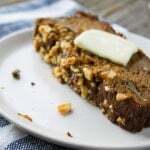 Totally agree banana bread is the best bread, and squash banana bread is probably even better and healthier!! Haha yes! I love it. Thanks! This looks incredibly moist and delicious! Very clever idea to combine bananas and butternut squash — sounds like a winning combo! It definitely was a winning combo! Can’t wait to make it again! Butternut and banana bread? count me in! sounds delicious!! !